There are days, in Italy, when football receives as much attention as politics, and sometimes even more. Today it’s been one of those days. Here’s what happened. As part of Serie A Football League, yesterday evening Lazio faced the leading team, Inter FC, which was returning from a dramatic yet heroic qualification to the Champions League Final on last week. The stakes were quite high: Inter had to win so to keep the lead of the League, given that Rome FC, who had played in the afternoon, was one point ahead. Rome FC and Lazio are both football teams of the city of Rome. Needless to say, Rome and Lazio’s supporters are arch-enemy. The football history of the city has always hinged around the Yellow-and-Red flag of Rome FC, and the Blue-and-White colours of Lazio. The former, celebrated by romantic songs and famous movies, the latter slightly less successful and with less liberal views. The differences have often resulted in inflamed clashes. 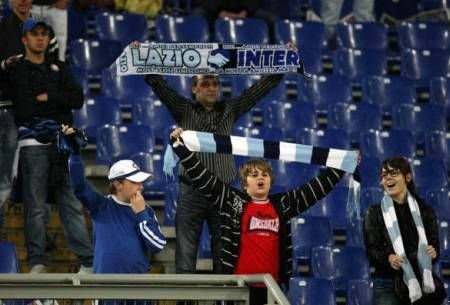 Before the match, Lazio fans found themselves in the strange situation of being able to help Rome win the League: in fact, had they won against Inter FC, Rome would have gone back to leading the ranking. Rome supporters, by the same token, had to get to grips with the idea of supporting Lazio’s victory, something which a true Roman does never do. However, Rome FC also feared that something fishy could have happened.. The result was that Inter FC won, 2-0. Inter is really rocking this year, and it would be hard for anyone to win against them. Nonetheless, someone noticed something strange happening during the match. Then someone started to think that things were not happening, so to speak, spontaneously. 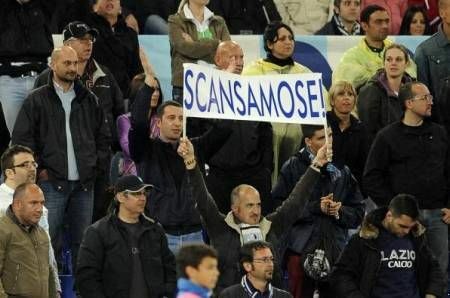 That is to say, that Lazio’s supporters did not want their team to win: more specifically, they did not want Rome to win. These doubts were buttressed, for example, by the fact that Lazio supporters were heard singing “Se segnate ve menamo!” (“If you score, we’ll beat you up!”), towards their own players. Some comments on the web, today, seem to avail this possibility. Lazio’s fans are quoted from their blogs as pointing out that it would be hell for them to have to live in a Yellow-and-Red Rome, following Rome FC’s victory in the League. 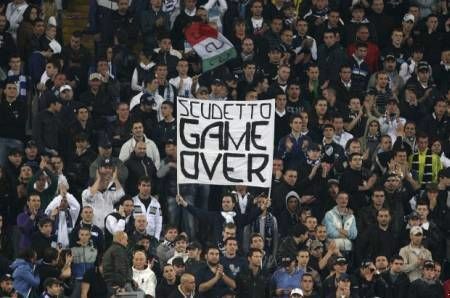 Nor could they accept the constant “sfottò“, the teasing that the Rome fans would throw at them if Rome won the League. Rome fans, on the other hand, are now yelling their rage against the Biancocelesti (White and Blue) in every corner of the media. Politicians have stepped in too, to comment on the match. Maurizio Gasparri, President of the Senators of the PDL, and strenuous Rome FC’s fan, remarked that yesterday “a page of shame was written”. Cicchitto, from the same coalition, defined the match “a depressing scene”. Paolo Cento, President of the Rome FC Club of the Chamber of Deputies (! ), highlights that what emerged from yesterday’s match is “the way football is managed”. A prompt reply arrived from the President of Lazio Club of the Chamber of Deputies (! 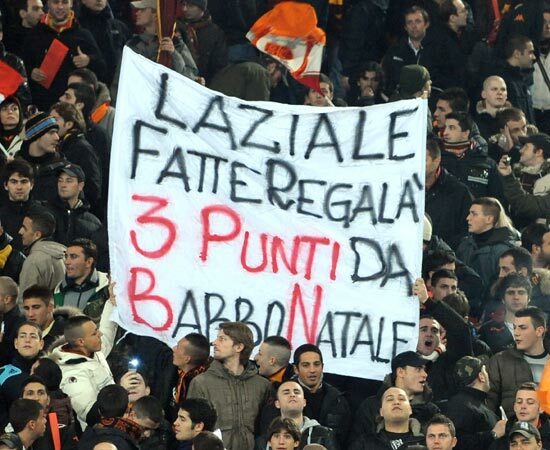 ), who highlights that Rome would have done exactly the same thing to Lazio. Gavino Angius, from the PD, went even further in stressing the ethical implications of the match, and called for sanctions against Lazio. I think it’s a bit too much, Gavino. I don’t think that Lazio players are to be blamed. 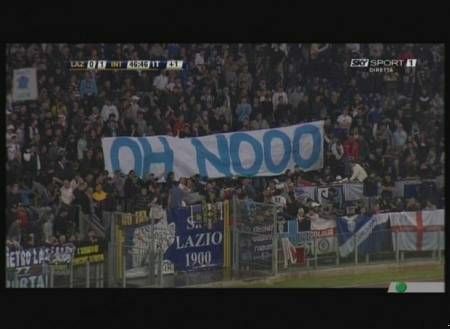 Nor, in my humble opinion, should Lazio fans. These things are part of football, I am afraid.